It’s hard to believe that spring is only a few days away. I hope you’re as excited as I am for sunny skies, spring fashion, and fresh, seasonal produce. And then there’s spring cleaning… I know I might be the only one who actually gets excited at the thought of scrubbing and dusting. But even if you’re not as obsessed with organization as I am, spring cleaning doesn’t have to be scary. One of the biggest tips I’ve learned as a lifelong neat freak is that if you keep up with routine chores on a regular basis, things will never get out of hand. 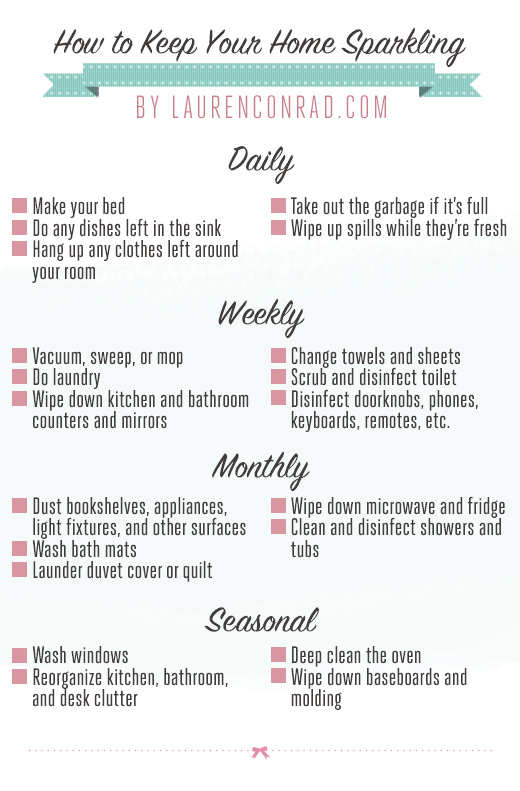 So to make things easy, I decided to put together a simple cleaning chart designed to keep you accountable on a daily, weekly, monthly, and seasonal basis. If you can spend just a few minutes each day tidying up, you will never have to clean like crazy just before guests come over or when you’ve finally reached your limit. I hope this post helps you to keep your space spick-and-span. Do you have any spring cleaning tips of your own?